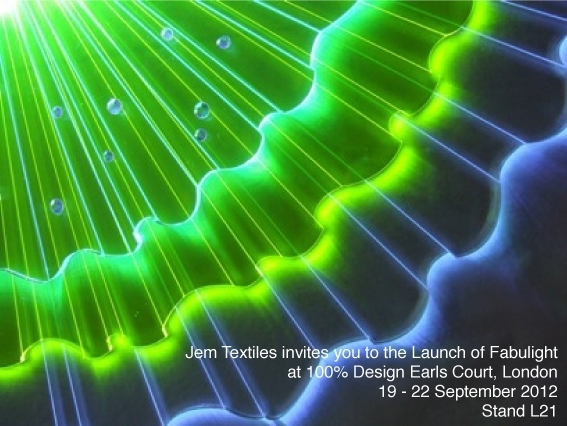 Congratulations to Jacinta & company at JEM Textiles who have been selected to attend the 100% Design show in London, Earls Court, from the 19th to the 22nd of September. 100% Design London exhibitors are all vetted by a panel of industry experts. The panel insisted that JEM’s new innovative product Fabulight was a must, just the kind of new product they love to showcase . 100% Design is the largest single-site design event in the UK. JEM Textiles can be found in the 100% interiors section on stand L21. This year there are four shows – each with its own dedicated section of the floor plan: 100%Interiors, 100%Office, 100%Kitchen & Bathrooms and 100%Eco Design & Build. A tunnel entrance, an auditorium seating 200 and a dedicated area for international pavilions will also be new for 2012. The show attracts exhibitors, visitors, designers and press from around the world. For 2012, they anticipate an audience of 40,000 visitors.